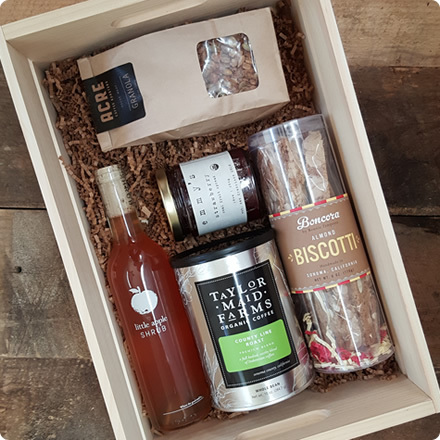 Every season we thoughtfully assemble a selection of the finest artisan food products, from responsible producers in California Wine Country, and deliver them to your door. Quarterly or Annual subscription boxes are available, as well as gift options. Crates are shipped quarterly in spring, summer, fall & winter. We pay for shipping! "The baskets provide us with an opportunity to open a special bottle of wine and pretend that we are in the beautiful wine country. A vacation in a box!" "I love the unique items found in your crates. Harvest allows me to experience a new product without the risk." "It's a great way to get a taste of wine country throughout the year!" We include the most delicious authentic and full-sized artisan products, from Sonoma, Napa, Marin, and ocassionally the greater Bay Area, that we can find. We select from small farms and craft producers that practice organic and/or sustainable growing methods. We seek the highest quality, gourmet products, made responsibly. We're a small family business, and aim to provide the best customer experience possible: from purchase, to package, to palate.